Blush mask is from Gypsy Renaissance's Wedding Masks collection. Blush is a white mask with white feathers, sequins, chiffon flowers, and pink rhinestones. Blush mask is covered with white satin fabric and decorated with white braiding and pearl and sequin trim. 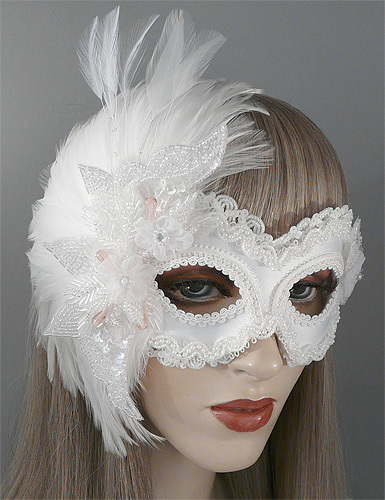 Mask is adorned with a semi-circle of white feathers and embellished with iridescent white sequin and glass bead appliqués and three petite chiffon flowers with rhinestone centers. Mask is finished with pale pink glass teardrop beads.